STI 6400 Emergency Exit Doors Alarm With New Features! The Exit Stopper is a unique and highly effective way to alert you to any unauthorised exits or entries through emergency exit doors. It can also serve as an inexpensive security device and help prevent theft. It is available in red or green and can be mounted or installed on almost any type of door, including remote placement of the sounder. The highly visible ‘STOP’ sign discourages unauthorised use of emergency doors. Prevent unauthorised exits and entries through emergency exit doors. Three year guarantee against breakage of polycarbonate in normal use (one year on electromechanical and electronic components). Compact design (136mm diameter and 50mm deep). Highly visible ‘STOP’ sign design acts as a deterrent. Virtually indestructible polycarbonate cover is UV-stabilised. Highly versatile; can be mounted or installed on any type of door, including remote placement of sounder. Can be installed and protecting doors in minutes. 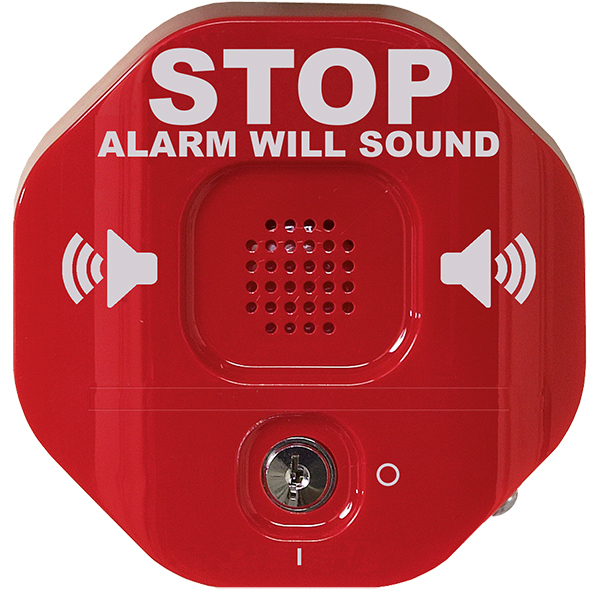 · Stand alone alarm system. Powered by a 9V PP3 alkaline battery (included). Incorporates a 12/24 VDC connection. 40 milliamp 9 VDC trigger output. 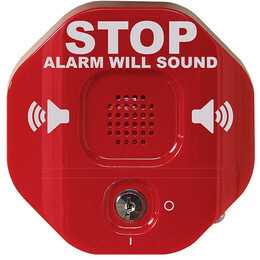 In exit alarm mode, alarm can be set to sound for 30 seconds, 3 minutes or indefinitely (unless disarmed with key supplied or until battery is drained). In annunciator mode, it announces door entry with a set of 10 beeps. May be programmed for 15 second entry delay or immediate alarm. Arming delay allows unit to arm following authorised exits. Variety of user programmable features. A key operated override facility will silence the alarm and allow authorised exits. piercing alarm for 30 seconds, 3 minutes or continuously (as preset by the user). A key operated override facility will silence the alarm and allow authorised exits. When the door is closed, a number of reset options are available including an automatic function. A variety of alarm durations and setup features are available (see User Programmable Features chart overleaf). The Exit Stopper is fitted with a 9V PP3 alkaline battery.